Business rules and validations related to an automated Business Process are generally hidden deep within the application source code and configuration settings. They are not openly accessible, easily to change or review. They might be duplicated several times across the source code. Operational Decision Management (ODM) systems try to remedy this situation by providing a central repository for business rules. This repository acts as a single source of truth for users as well as systems. Rules are generally specified in the form of Decision Tables or Trees. ODM complements BPM (Business Process Management) systems well, as BPM is also metadata driven with a focus on business process workflows and SOA (Serice Oriented Architecture) for integration. 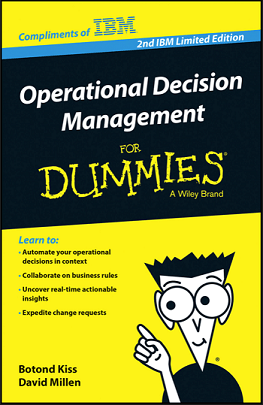 Operational Decision Management for Dummies is a free booklet sponsored by IBM which provides a nice and quick definition of ODM systems. It is recommended for anyone interested in understanding what ODM is, what are its use cases and potential pay offs. You can also check out this article for some concrete examples on how operational decisions (business rules) are automated by any ODM system.